It’s been more than nine months since Katy and I hit the road for our Regional Flavours adventure, so when an invitation for the Soul Boardwalk ‘Nights in Paradise’ fashion parade arrived in my inbox, it seemed the perfect excuse for another girls’ weekend away. When it comes to #instaworthy hotels on the coast, it’s hard to go past QT Gold Coast with its vintage panel van, complete with long boards strapped to the roof, parked in the drive, 50’s style staff uniforms, bright decor and comfy couches. And then there’s the Astro-turfed outdoor bar/pool area with giant jenga and Connect 4 sets, as well as a complimentary iced tea and homemade lemonade station, so it really was the easy choice when it came to choosing somewhere to stay. Located a block back from the beach, the hotel is within walking distance of Surfers Paradise’s famed Cavill Ave, the new Soul Boardwalk precinct with premiere casual dining options and shops including Roxy and Sunburn, mini golf and one of those terrifying parks where they slingshot you into the air. Our ocean view twin room was modern and featured quirky touches including a cockatoo lamp—which I would have bought had I not spent all my money shopping the amazing sales at Harbour Town—, striped wall in the bathroom, pineapple shaped knick-knacks and an amazing DIY lemonade stand. When life hands you lemons … go on holidays. The Alex weekender by Zurii. Forgot your beach bag? No worries! QT Gold Coast is the unofficial home of TeamStripes. For those who fancy a spontaneous getaway, there are beach bags you can use; thongs you can buy; vintage cruiser bikes you can borrow; and even an “in case of emergency” bow tie in the mini bar in case you want to pop open the bottle of Mumm and make a real night of it! After dropping our bags and our shopping in our twin ocean view room, we headed straight for the poolside bar to enjoy a couple of cocktails from Stingray Lounge. Surrounded by tropical foliage and a sunken foyer bar with bright yellow ‘Acapulco’ lounge chairs, the QT pool boasts white sun lounges and handy side tables for mojitos, making it a tempting oasis for those not keen on getting sandy. If you’re looking to be pampered, the onsite spa, SpaQ, is the place to go. Yamagen, also located on site, serves up delicious teppanyaki and sushi. 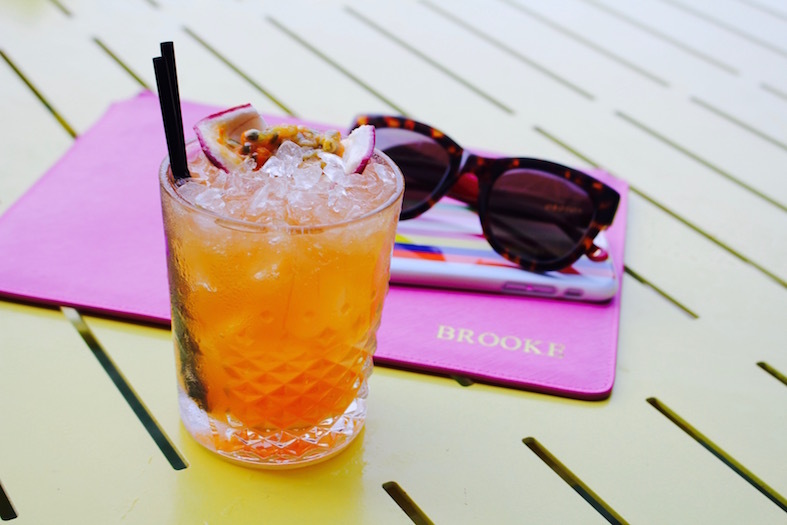 The Skinny Pash cocktail (vodka, passionfruit, Aperol, pineapple, agave and lime) from Stingray Lounge is worth the drive to the coast. It’s in my Top 5 all time cocktails. Seriously. My cocktail of choice … the Skinny Pash. After the fashion parade and dinner, KP and I made good use of the beds (not like that!) by returning to our room early so we could crank the air con and snuggle down to watch a movie. Air-conditioning teamed with blackout curtains meant I slept uninterrupted all night, leaving me feeling refreshed for a Sunday in the sunshine. In my mind, Sundays are for brunching or lunching, so to please our grumbling bellies, we headed straight for Bazaar Restaurant to hit the breakfast buffet ($32 adults) where we were greeted by friendly staff and one of the best stocked buffets I’ve ever set eyes on. There were more than 10 different types of pastries to choose from; an omelette station; staples including bacon; scrambled, fried and boiled eggs; delicious yoghurt and bircher muesli pots; waffles; pancakes and even soft serve ice cream, much to the delight of the young and young at heart! With full bellies, and a phone full of photos, it was time to check out and head into the sunshine. If you’re heading to the Gold Coast and want to stay somewhere bright, fun and worthy of cute photographs, I’d recommend QT Gold Coast. As well as the free lemonade and free bike hire, there’s also free WiFi so you can make all your friends back home jealous! Perfect for: Fun beach breaks and romantic weekends away. Find QT Gold Coast on Staghorn Ave in Surfers Paradise, Queensland.